BURLINGTON, Vt. - Amy Potomak's goal in the second period lifted the second-ranked Minnesota Gophers (13-2-1, 9-2-1 WCHA) over the Vermont Catamounts (3-8-4, 2-6-2 WHEA) in the Windjammer Classic championship game Saturday night at Gutterson Fieldhouse. "Congrats to Minnesota for winning the game and the championship," said head coach Jim Plumer. "I'm proud of our effort and our ability to skate with the second best team in the country for a large portion of the game. Our young team is getting so much better with each week and I am excited for a big weekend with Maine coming up." - Minnesota opened the scoring at 1:13 in the first period on a goal by Catie Skaja. Emily Brown fired a shot from the point that Skaja deflected to beat Melissa Black (33 saves). Tournament MVP Kelly Pannek had the secondary assist. 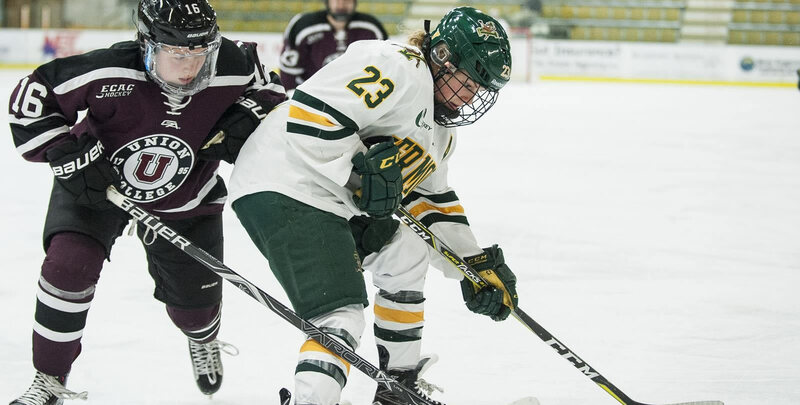 - Kristina Shanahan and the Catamounts answered after the midway point of the second period when she collected the puck in the corner and wheeled around the top of the zone before wristing a shot over the glove of Alex Gulstene (19 saves). - The Gophers retook the lead with 1:02 left in the opening frame on a goal by Taylor Heise. Nicole Schammel distributed a pass to Heise on a 2-on-1 rush for the Minnesota forward to chip in to the Vermont goal. - Potomak's game-winner came with 13:06 left in the second period in the middle of three unanswered goals for the Gophers. - Alyssa Gorecki netted the Catamounts' second goal when Theresa Schafzahl chopped a pass up, springing the senior captain on a partial breakaway. Gorecki neared the goal with a defender pressuring her and slipped the puck under the pads of Gulstene. - Minnesota's Kelly Pannek and Katie Robinson added two more goals to put the game officially out of the reach for the Catamounts.